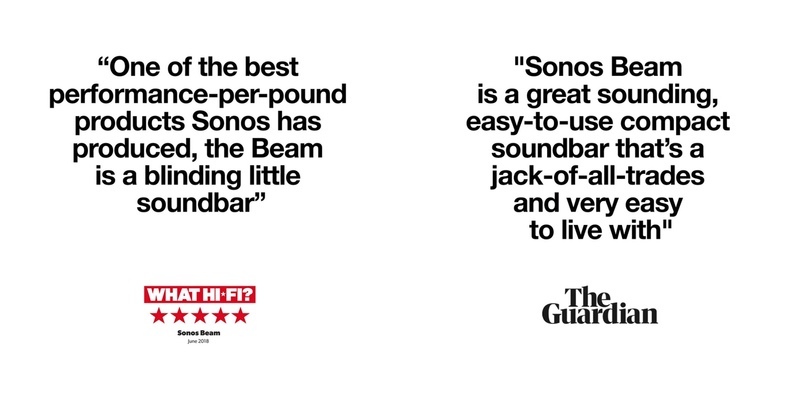 The Sonos Beam brings all of your audio content to life, whether that's your favourite music, TV shows, movies, games, audiobooks and more – with the bonus of Sonos' heritage sound quality. Combine this with four different types of control, this is Sonos' most advanced and most ambitious Soundbar at an affordable price point. The Beam is simplistic in design but not in performance. 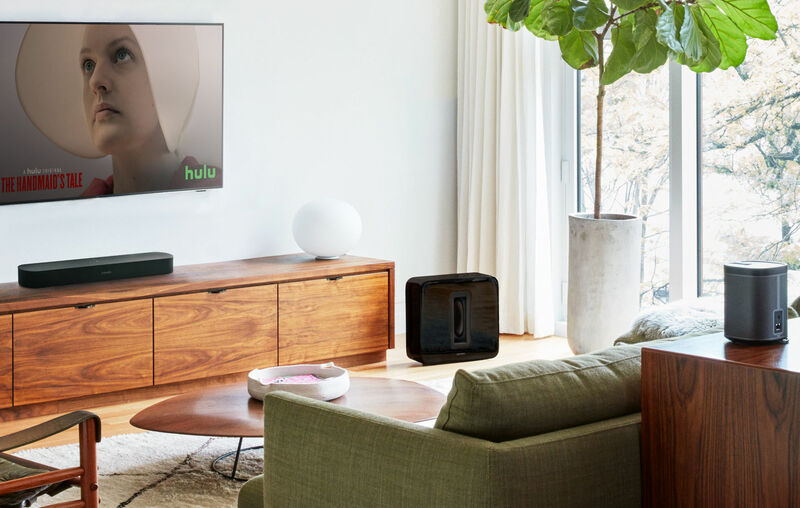 Not only does it dramatically enhance the sound from your TV content, the Sonos ecosystem is well established as one of the best on the market. With quick access to your own music library and over 50 streaming music services available through the Sonos app, the Beam gives you limitless choice with what you'd like to stream. 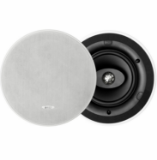 With four full-range drivers and a tweeter, the Beam emits a crystal clear sound. The nature of the speaker's design also pushes the sound wider, giving you a soundstage that carries further and fills more of the room. To make sure that action-intense movies provide ‘edge of the seat’ thrills they are produced for, three passive radiators supercharges the bass so it's always there when it's needed. Ask Alexa to search for any artist or song, playlist or music that Alexa think you might like based on your listening history and playlists. With five, far-field microphones built-in, Beam can hear your commands from the opposite side of the room, even when the music is playing loud. Play songs, check news and traffic, manage smart home devices and enjoy all of the Alexa skills as they are added over time on your Beam. The Beam will get smarter over time and there is no need to replace the product every few years. Sonos respects that privacy is paramount. For this reason, when the microphone LED is on, Alexa is ready for voice commands. When the light is off, the microphone is disabled and all power is cut to the microphone. Adding the Beam to your system is easy. Simply connect to the mains then plug in your TV via HDMI-ARC. In contrast to more traditional home cinemas, you save on wires and also set up time. 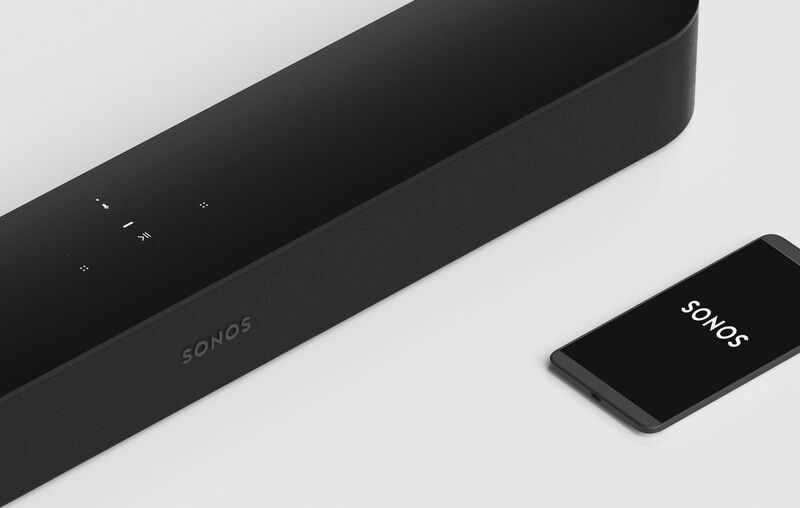 At just 651mm wide, the Sonos Beam can fit snug in spaces where ordinary soundbars won’t fit. Slim height and depth dimensions also make the Beam visually and physically unobtrusive, making you focus on the TV content you're watching, not on the speaker. Easily expand your Sonos network by adding speakers to different rooms wirelessly to create a home sound system that brings every room and everyone closer together. Regular software updates means your product is constantly improving and striving to be better. Having a lot of trouble with the Sonos Beam. Absolutely awesome. High quality sound and plenty of it. We have one open plan living area, 8m x 10m. This fills the room. Very easy to set up and use. Alexa voice control is tremendous and the Alexa and Sonos apps work well. It's not often that I buy something which exceeds my expectations. This does. Easy to install and teamed with two Sonos Ones the Sonos Beam gives excellent surround sound with downloaded or DVD movies. A great performing compact sound bar with my 2 x sonos ones and sub I can't fault it easy to set up via the app great crystal clear sound alexa works great honestly can't fault it. It was a toss up between Bose 700 system with sub and this I listened to both before making a choice and I must say the sonos out performs the dose in every way also the bose is terrible to set up and the bose app in my opinion is useless. Simply a wonderful box of sound and tricks! Excellent supplier. Quality of goods and service not to be faulted. I purchased this item on the back of several recommendations from work colleagues and although I'm happy with everything I would be wary of buying this item if you don't have an ARC connection on your TV as this seems to be central to how the whole system works. Alexa seems to work ok, but I don't have a yardstick on which to measure this as it is the first device in my house that has this feature. The only thing I had trouble with was getting it to connect to my wifi network as the Sonos app wouldn't allow me to search for it until I'd switched on one of my other already connected Sonos devices. The other difficulty I had was that another one of my Hdmi devices was causing a conflict with connecting to my TV so had to disconnect everything to find the offending item!! Apart from this, all seems good. Sounds good, Alexa not as forthcoming as a dot. The sound from the Sonos Beam is excellent however if you are thinking of purchasing it, do some research as to whether your TV can pass through Dolby Digital mine doesn't. There are lots of issues with the ARC hdmi on numerous TV's mine is an older(!) 2015 Samsung - optical is a workaround but not satisfactory. Hopefully my next TV will solve any issues. Sounds better than i thought and alexa is very useful. Top marks. There is a serious problem with lip sync through the hdmi arc when setting to Dolby. Yes, it’s fine when set to stereo but the sound is vastly superior with Dolby. Currently trying the digital optical but you then lose the arc functionality. The Beam might be going back for a refund as this is unacceptable. This was set up on my Tv with 2 play 1 speakers. Very easy to set up straight out of the box. Once set up I spent a few minutes tuning and then refining the balance of the speakers in the room. What an amazing sound you get from this setup. 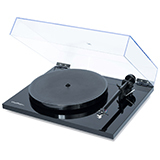 I would’ve definite recommend the play bar especially paird with 2 play 1’s, excellent purchase. I live in a flat so have not fully tested its limits, but it was very easy to connect and setup. You have to download the Sonos app to do this and the Alexa app if you want to join any Alexa device to the Sonos. This only takes a few minutes and it tells you what you are required to do. Best product ever . Amazing sounds . Very easy to set up . Brilliant sound quality. Really easy to set up. Note: I paired mine with 2 Sonos Ones as surround sound and cannot comment on the Beam when used by itself. The whole set-up however sounds incredible, speach comes from the beam in the centre of the TV but when watching action movies etc the surround sound just makes watching a film so much more enjoyable and intense! Love Sonos products and this is no different - brilliant sound, good bass, perfect for music and Alexa, especially if you have Philips Hue lights etc - just seamless! Happy with Sonos Beam but wonder whether buying a Sonos One and a separate sound bar would have been the better option for the price. The Sonos Beam has greatly improved my TV sound with the added benefit of Alexa & also being able to use Siri as well. Have easily set up my 2 existing Play:1's as surrounds which sounds even better. Absolutely amazing product and great delivery from smart home sounds. Never ordered from you before but very impressed and the Sonos Beam has made me very happy. Thanks again. Amazing! Great sounds, looks great too and music sounds brilliant. So easy to set up. Perfect! What else can i say!